Though traditionally labeled "Baroque," the seventeenth and early eighteenth centuries in music could as easily be termed "early modern," since many of the genres that are popular today—were established during that time. Wendy Heller's Music in the Baroque traces the production and consumption of music in the seventeenth and early eighteenth century. Going beyond a history of styles, the text explores patronage, education, religious and civic ritual, theater, and visual culture. Heller focuses not only on the nature of music in the Baroque period, but also on the very different ways in which men and women experienced music in their daily lives. Treating music as an expression of political and national identity, she examines it in the context of the era's art and literature, political and religious conflicts, and contentious issues of class and gender. 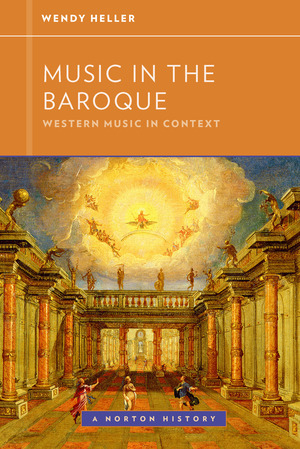 Like the other volumes in the series, Music in the Baroque brings a fresh perspective to the study of music by emphasizing social, cultural, intellectual, and political contexts of the music. Wendy Heller looks far beyond the notes on the page or the details of composers’ lives to embrace audiences, performers, institutions, and social settings. For example, the text argues that a narrow focus on composers and works obscures important aspects of eighteenth-century musical life, such as the growth of the symphony orchestra and the internationalization of musical culture. Along with the other volumes in the series, Music in the Baroque is designed for maximum flexibility in the classroom. The text may be packaged with the accompanying 31-work anthology, with Strunk’s Source Readings in Music History, or with Norton Critical Scores, all at a significant discount. The text is also available as a low-priced ebook.